Post updated. See last paragraph of Curiosity section. 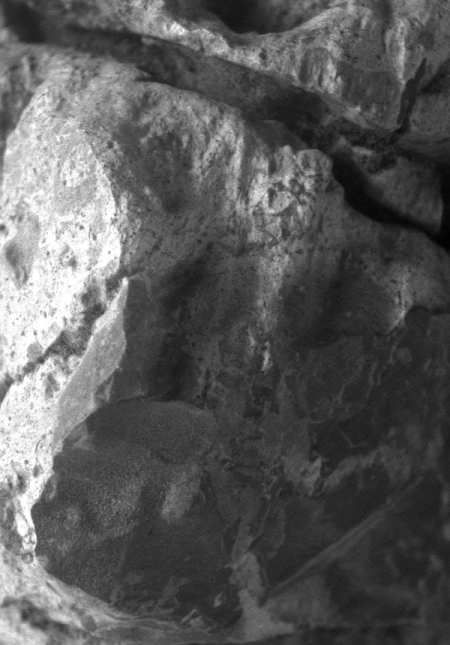 Their eventual goal, indicated above as first the Hematite Unit, then the Clay Unit, and beyond the Sulfate Unit (the title partly cut off by my cropping), can be seen in the wonderful picture below, released on October 2, 2015 image when Curiosity was only still approaching the foothills of Mount Sharp. These features are actually just out of view on the left in the panorama above. 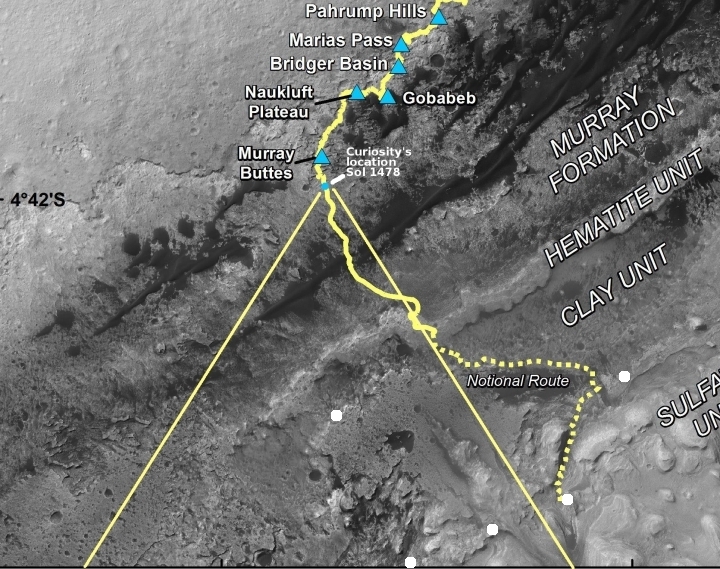 To get to them, Curiosity has to pass through the black sand dune area shown in the overhead traverse map, and they need to find the shortest and easiest route through those dunes without getting the rover stuck. The best route found so far from orbital images is indicated by the yellow line, but I think they are going to be picking and choosing their path very carefully as they move further south. 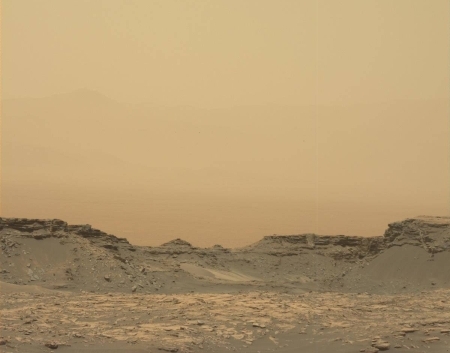 One more thing: The atmosphere has become very dusty in recent weeks at Gale Crater, so that many of the recent images being taken by the rover have been expressly aimed at observing the steadily declining visibility. The image on the right, taken on Sol 1475 by the mast camera, looks back past Murray Buttes to the crater’s northern rim, now hardly visible. Early images back in March had shown the rim clearly with a crisp view. No longer. Whether this increase in dust in the air is the beginning of a global dust storm is as yet unknown. The air at Opportunity remains clear, so if a global storm was coming it has not yet arrived. UPDATE In taping tonight’s appearance on the John Batchelor show, John directed me to this Nature article about the debate in the Curiosity science team about whether they should have the rover visit some of those recurring black streaks seen on martian slopes, thought to be possible seeps of water. I have indicated the nearest of these streaks with white dots on my overview image above. The concern is that Curiosity was not decontaminated the way many scientists would have wanted if they had known during its construction that it might visit these streaks once on Mars. Some think it will not be a problem, while others are justifiably concerned. They do not want to contaminant future research with Earth microbes, but they also don’t want to miss this golden opportunity to actually sample and test some actual Mars liquid water. Since my last update, Opportunity has not moved much. In the past week it has crept almost to the peak of the mound it had been aimed at, and has taken a lot of close-up images of the rocks there. The image on the left, reduced and cropped, was taken by the rover’s Microscopic Imager on Sol 4515. I am not a geologist, but if I had to guess, I would guess that this image (as well as many of the other close-up images they have taken here) shows melt features. I also wonder if the veins of material in the rock also suggest past liquid water activity. Both guesses could very easily be very wrong, so please do not quote me. I still believe they will move the rover south and to the east, closer to the inside edge of the rim of Endeavour Crater and overlooking the crater floor. We will have to wait, however, to find out. Could Mars have had water on its surface? Someone said the mass of Mars is too little to hold water. It would evaporate and dissipate into space. Water turns into a gas very easily and would seem not to be stable on the surface. JR Cosgrove: Your question encapsulates the number one mystery that planetary scientists have been puzzling over about Mars now for almost a half century. The geology on Mars provides ample evidence that liquid water once flowed on the surface. The conditions today however make that impossible. Thus, Mars had to have changed in some fundamental ways over the eons, having once been wetter with a much thicker atmosphere. Figuring out how that happened however continues to be elusive. See this post, Our limited understanding of the Martian climate through time, on Behind the Black outlining and summarizing the scientific mystery. Water has a molecular weight of 18. A molecule with such a small mass could not be held on the surface or in the atmosphere by the mass of Mars in anything but a solid state. It needs a larger mass to keep if from dissipating. From what I understand there is water in a frozen state in other places in the solar system but if it is liquid, it must he held in place by some containment system since exposure to an atmosphere or space would lead to it quickly evaporating away. If this is not true, I would be interested in the explanation. I did read your link which indicates that Mars once had water. I would added this to my previous comment but posted it before including that I had read the link. Is there any way to edit comments.